When your phone is paired, the contents of its phonebook and call history are automatically imported to HFL. When you select a person from the list in the cellular phonebook, you can see up to three category icons. The icons indicate what types of numbers are stored for that name. If a name has four or more numbers, ... appears instead of category icons. 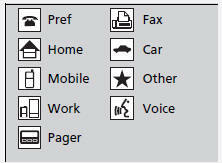 On some phones, it may not be possible to import the category icons to HFL. The phonebook is updated after every connection. Call history is updated after every connection or call.